Summary: For the millions who log in every day, Warcross isn’t just a game—it’s a way of life. The obsession started ten years ago and its fan base now spans the globe, some eager to escape from reality and others hoping to make a profit. Struggling to make ends meet, teenage hacker Emika Chen works as a bounty hunter, tracking down players who bet on the game illegally. But the bounty hunting world is a competitive one, and survival has not been easy. Needing to make some quick cash, Emika takes a risk and hacks into the opening game of the international Warcross Championships—only to accidentally glitch herself into the action and become an overnight sensation. Convinced she’s going to be arrested, Emika is shocked when instead she gets a call from the game’s creator, the elusive young billionaire Hideo Tanaka, with an irresistible offer. He needs a spy on the inside of this year’s tournament in order to uncover a security problem . . . and he wants Emika for the job. With no time to lose, Emika’s whisked off to Tokyo and thrust into a world of fame and fortune that she’s only dreamed of. But soon her investigation uncovers a sinister plot, with major consequences for the entire Warcross empire. I won a copy of Warcross in a giveaway, and I honestly wasn't sure what to expect. I figured that I'd give the book a try since I had a copy, but I was not a huge sci-fi fan and I've never read anything by Marie Lu before, so I went into this entire ordeal totally blind. Amber has read and enjoyed some of Marie Lu's books before, but other than that, I really had no idea what to expect. However, I was delightfully surprised. As someone who isn't a huge sci-fi fan, this book had me hooked from start to finish. It's also such a great feeling to be giving two books in a row five-star ratings, which is something that hasn't happened to me in the longest time. From the second I opened this book, I was immediately immersed in Emika's story. This book had just the right moments of sadness, action, badassery (yes, I recognize that as an official literary term), and even heart-fluttering gasps. Emika's story and the futuristic world that she lives in is so complex and gripping that any reader will find themselves wrapped up in its awe. As the summary explains, Emika is a teenage bounty hunter in New York City. Warcross is a popular virtual reality game of sorts for the generation, and Emika one day finds herself accidentally hacking into one of the largest Warcross championship screenings in the world. She figures that she's going to get arrested (since that is a crime), but instead, doors open for her that she couldn't dream of even in her wildest imagination. Hideo Tanaka, the business mogul who coined the game and was officially one of the richest (and most eligible) young men in the world, immediately takes an interest to Emika. He even winds up hiring her for a secret job to help discover someone who was threatening the future of Warcross...but what Emika steps into is a mess that she never could have imagined. What I liked best about this book was Emika's personality. She was tough and brave and stood up when she needed to, and she was incredibly intelligent. I mean, she manages to attract the attention of one of the most famous men in the world because of her excellent hacking skills, and then finds herself with the bounty hunter job of a lifetime. How cool is that? (Minor spoilers coming, so please skip to the next paragraph if you haven't read this book yet!) I also really loved the blooming relationship between her and Hideo. Especially those scenes where they got super close -- I remember openly squealing in public while I was reading them and blushing from head to toe because it was just so damn cute. But I also really liked how their relationship wasn't the primary focus or goal of the book -- it was Emika completing her mission and being a total badass in the process. I also really liked the futuristic world of Warcross itself -- it's such a unique idea that basically turns The Hunger Games up to 1000000 and makes things even more badass. There is seriously so much badassery in this book -- I can't handle it. This book made me want to go out and start hoverboarding through New York City and catching bounty hunters and being fierce and brave and cool. I wish. I really can't think of anything I didn't enjoy about this book, which is shocking to me since I'm normally really confused by sci-fi and therefore always have at least one thing to point out. This book had me hooked from start to finish, and it was riddled with plenty of twists and turns to keep things interesting. There were several plot twists (especially towards the end) that I weren't expecting, and I found myself delightfully shocked and surprised. I'm satisfied with how the book left off, but I'm also itching to get my hands on the next copy to see where Emika goes with everything and how everything pans out. Overall, I absolutely loved Warcross. I've already added the unreleased second book to my TBR on Goodreads and I'll be eagerly anticipating it. This book had me hooked from start to finish and I tore through it much faster than I've read any book in awhile, and I'm incredibly grateful and thankful towards Marie Lu for giving me the reading bug again -- something which is pretty hard to come by when you're in college and drowning in midterms! I literally carried this book with me everywhere I went and read it on the walks to and from class (without tripping on too many things, thank goodness). 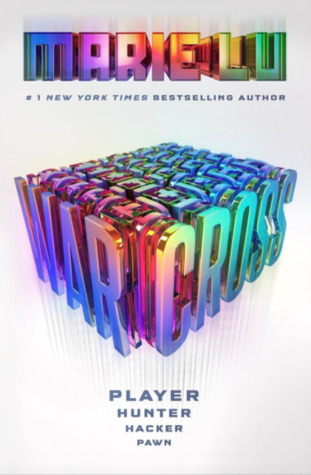 If you think Warcross isn't your cup of tea and you find yourself shying away from it, I encourage you to pick up the book and give it a shot anyway. It got me hooked in ways that science fiction books haven't since I first read the Zodiac series by Romina Russell. I really, really loved Warcross and I will officially be pushing it on everybody I know -- which includes you! So what are you waiting for? Click to Read Amber's Review of Warcross!